Earlier this year, Virginia Master Naturalists were offered an opportunity to participate in a citizen science project to gather much-needed field data about the status of native blue orchard bees in Virginia and to determine possible competition with non-native bees. Louis Harrell participated in the project and shares information about the bees, the project, and results to come. I learned about a volunteer project to monitor native mason bees from the Virginia Master Naturalist program. Mason bees are part of the genus Osmia, which include both natives and non-native invasive bees. These bees are solitary and nest in hollow cavities. The native mason bee species known as the blue orchard bee (Osmia lignaria), is one of the few native bees used for agriculture pollination. However, environmental scientists are concerned that this bee may be declining in numbers and may be adversely impacted by invasive species including Osmia cornifrons and Osmia taurus, both of which look similar to the blue orchard. Osmia lignaria. Image from USDA Forest Service. Osmia cornifrons. Image from BugGuide.Net. Osmia taurus. Image from BugGuide.Net. To analyze the impact of the invasives on the blue orchard bee, University of Virginia graduate student Kathryn (Kate) LeCroy and her faculty mentor, T’ai Roulston designed a project to test for the presence of the bees and also determine whether mason bees would inhabit “bee hotels” so they could be monitored, and if so, which type of hotel they would prefer. The primary goals of the project are to track the native blue orchard bee as well as the invasive bee species that are spreading in the mid-Atlantic and to determine which of these species are more likely to use the bee hotels. 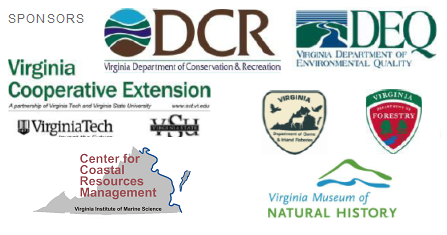 The program included 100 sites located across Virginia in rural and urban areas. A subset of the rural part of the sample used bee bowls to sample the range of bees in their areas. My two bee hotels (one tubular and one box design) were delivered in February of this year and I installed them in my backyard in Manassas. Mason bees have an ability to detect very slight changes in position and the test needed to have the hotels mounted about 4 feet above the ground. The hotels were attached with zip ties and tape to two trees. Mason tubular (left) and box-shaped (right) bee hotels. Photo courtesy of Louis Harrell. The bees seemed to prefer the tubular hotel design while ants really liked the box shaped design. It took two months for bees to start nesting in the tubular design and for the ants to move into the box shaped design. Once the ants moved into the box shaped hotel, no other insects were observed. The bees had not yet emerged from the tubular hotel by the time my role ended, so I cannot say anything about the species of bee using the hotel. Each week, I sent a report to Kate LeCroy on the status of the bees. The reports included a photo of the bee hotels and some text if anything interesting happened. Reports were dull until the end of April, when the bees started to fill in the tubular hotel. Five bees moved in to the tubular hotel and filled the entrances with mud. LeCroy picked up both hotels in June and she and Roulston are beginning the arduous work of identifying and counting the collected bees. By the end of this year, they should know more about the numbers and distribution of mason bees in Virginia. So, more information is yet to come. You can read more about the project here: https://news.virginia.edu/content/help-citizen-scientists-uva-researchers-count-virginias-bees. Projects such as the mason bee research give ARMN members and Master Naturalists from other chapters the opportunity to participate in significant research and learn something about insects and important conservation issues.